Today's surprise offering from food-rap godfather 2 Chainz is the Georgia rapper's usual word salad, generously topped with hooks and ad-libs. 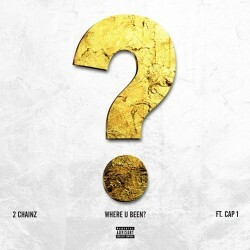 “Where U Been,” Chainzy Boi's new single, doesn't break any untilled ground for a rapper who's spent this much time in the game, but It's got a solid beat from superproducer Mike WiLL and enough silly lines that you won't forget who it is that you're listening to. Cap-1's contribution makes the track a little more interesting – for a guy who doesn't even have a Wikipedia entry, the man flows hard. Cap's been in the game longer than most, like Chainz himself, so it's always nice hearing his rapid-fire on a new track. Like his co-pilot, Cap's lyrics aren't anything phenomenal, but in this kind of track I care more about flow and delivery than any sort of far-reaching lyrical impact – if you're getting turnt to 2 Chainz, the only lyrics you're even going to remember will be the hooks. Based on what we've heard so far, between “Where U Been” and last month's “Feds Watching,” Chainz's upcoming B.O.A.T.S. II: Me Time looks to be a perfectly inoffensive rap album that will serve as a great promotional tool for what is arguably the most highly-anticipated cook book of all time – cop it on September 10.